2017 marks the Golden Jubilee of Saint Bernadette’s Church in Belfast. This Sunday 29 October, at 3.00pm, Saint Bernadette’s will hold a special Anniversary Mass to celebrate 50 years to the day since the opening and dedication of the iconic fan-shaped church. Chief celebrant for this Mass will be Bishop Anthony Farquhar, Bishop Emeritus of Down and Connor, who took part in both the original ceremony to lay the foundation stone and the Dedication Mass, and has returned on many occasions. He will concelebrate with Parish Priest Father Paul Armstrong along with many of the priests who have served Saint Bernadette’s over the years. 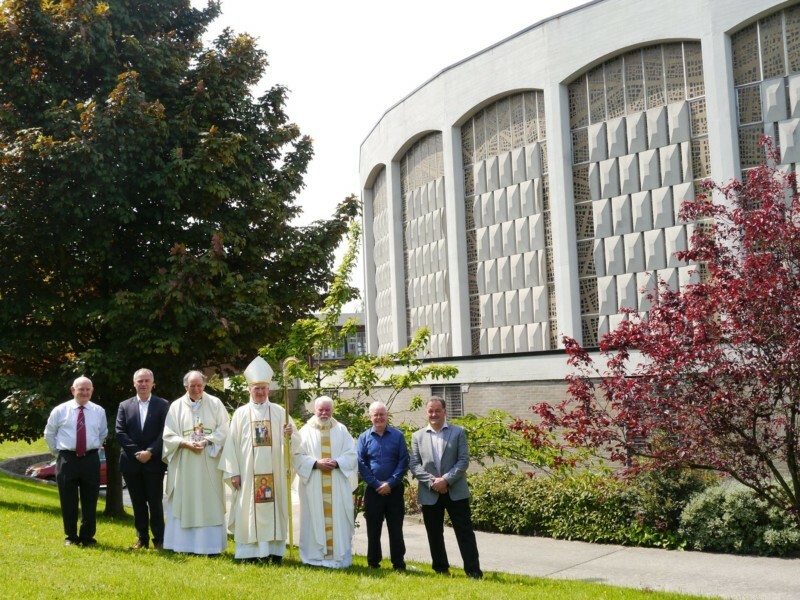 The foundation stone for Saint Bernadette’s Church was blessed and laid on 8 September 1965, on the feast of the Nativity of the Blessed Virgin Mary, and the late Bishop William Philbin of Down and Connor opened and dedicated the church on 29 October 1967, the feast of Christ the King. The church can accommodate up to 1,200 people, making it one of the largest churches in the diocese. Extensive renovations, carried out by local architects, Kennedy and Fitzgerald, have been undertaken on the church over the last two years in anticipation of the jubilee. Most notable is the restoration of the striking stained glass windows which trace the colours of the rainbow and follow the path of the sun through the day, centred on a vivid cross. The church is also well known for Dame Elisabeth Frink’s nine-foot-high sculpture of Christ which floats above its altar, and for its many other items of fine modern art. The project also included improved access and facilities for disabled users, new bespoke nave and altar furniture, pew and kneeler refurbishment, Baptismal Font relocation, thermal improvements, replacement of existing flat roofs and minor external works. All are welcome to attend, particularly former parishioners. For those unable to attend, the Golden Jubilee Mass will be live-streamed on the parish website, www.stbernadettesparish.org. For more information please see www.downandconnor.org.